Voix de Femmes – female vocal festival. Basil Howitt reports on the exceptionally dynamic village of Maury under its long-time mayor, the potter Charles Chivilo. 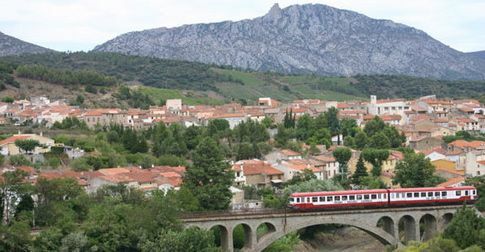 If you head west on the D117 from the Catalan border town of Estagel, with the unforgettable 10th century fortress of Quéribus towering above you on your right, you soon come to Maury, the first village along this route in Le Fenouillèdes, or the Land of Fennel – or even Fenolheda in Occitan-speak. Le Fenouillèdes is part of Occitan Languedoc, whose inhabitants are rather scornfully referred to by Catalans as “les gabatx” or foreigners. Skirmishes between the “gabatx” of Maury and the youths of Estagel are still not unknown. Unless they are turning off for the dizzying climb to Quéribus, many tourists drive straight through Maury’s very narrow main street en route for the Aude. However, thanks to the dynamism of Maury’s mayor, Charles Chivilo, and many others, more people are pausing there to dine, buy wine and enjoy many communal events. Maury (population 901) has long been famous for its sweet red fortified wines (Vins Doux Naturels or VDN) – rich, aromatic and very fruity, made from Grenache noir grapes. Basically, these wines are produced by stopping the fermentation with the addition of grape spirit, and have enjoyed AOC status since 1936. The trouble is that not so many people want to drink these magnificent bottles any more. Less than 10 years ago the Cave Cooperative of Maury was close to collapse, with a debt by 2003 of 1.7 million euros. A receiver was appointed to try to steer the cave through the crisis. With the dramatic fall in takings, the majority of vignerons had decided in 2001 that the cave must diversify into dry wines – reds, rosés and whites. This majority, under its newly elected president, Paul Armingaud, thus took control of the cave’s administrative council. In addition to a red Côtes du Roussillon-Villages, new country wines such as Terra Novo and Les Maurynates appeared. But not without a lot of heartache! Many diehard vignerons refused to deviate from VDNs and abandoned ship. “This major haemorrhage nearly killed us off,” admitted Armingaud. However, by dint of hard work and rigorously imposed budgeting, the Cave recovered in spectacular fashion. By 2006 the books were balancing, and with a turnover of around 1.57 million euros in 2007, the Cave increased its dividends to members by 46%. Harvests are now around 25,000 hectolitres, two thirds of which are VDN and the remaining third dry wines. In Armingaud’s words, “the Cave’s fortunes have been saved not by its VDNs but by its vins secs”. None the less, those thousands of litres of VDN still need to be sold – so what better idea than to lay on a chocolate fest in which professional chocolatiers spent a day sampling 18 different Maury VDN wines with 18 different chocolate creations in the company of 40 professionals from the wine and catering trades? So it was that on Saturday 5th April the renowned chocolatiers Christian Constant and Olivier Bajard (each holding a coveted Meilleur Ouvrier de France or Best Craftsman of France award) guided the assembled gourmets through an exploration of what must have been a paradise of flavours. Each participant held a glass of Maury in one hand and a chocolate creation in the other. For the chocolatiers this was serious work of course, “with an intellectual perspective”, however amazing that may seem to you and me. One of the biggest surprises for the participants was the marriage of an old rancio (an intentionally oxidised VDN) with a concoction of chocolate with quails eggs and anchovies! Another fortuitous marriage included conventional Maury wines with chocolates flavoured with honey gathered from fir trees, and cinnamon. “We opened in June … the Michelin inspectors visited us in July and they were demonstrably impressed by the unique concept of matching our dishes only with local wines. “The award of a star to a restaurant featuring only local wines and pioneered by a local mayor is exceptional. He and the villagers have shown remarkable confidence in me by handing me the keys to a fully equipped restaurant. The award of this star thus touches me all the more. Borell’s immediate ambitions are to acquire another star, and to build 25 guest rooms. Another unique innovation of Charles Chivilo is Maury’s Festival of Women’s Voices. The concept is to feature only vibrant female artists, some well known, others up-and-coming. This year’s event took place last weeekend. What a pity the weather was so unusually cold for mid June. BASIL LEFT US THIS YEAR AFTER A LONG STRUGGLE WITH CANCER. I’ve never actually met Basil in person, but he has been one of my dear Internet friends for a number of years. He left us at the end of 2011, after a long struggle with cancer, and although I never actually shook his hand, this is my loss, and I am sad that I never made more of an effort to be anything but an Internet friend. Rest in peace Basil. Your fascinating insights into history, heritage and life in the Pyrenées-Orientales will live on. The English word ‘gin’ comes from the French word genièvre, (juniper) the berry which gives gin its distinctive, bitter flavour.